I wonder if someone could shed some guidance on my build? 2: Apart from stopping the str4ack - do we need the limit switches - I owuld like to avoid the extra cables. 3a:Some thing is not right, the display shows garble to start on power up then stays blank, I get no readings on it. 3b: The buttons are erractic - I am running the Test and Calibration tool. Both MODE and ADJUST i get no change in POT values at all. No display (not even garble on startup when powering via USB, garble only appears when I plug-in my 12vlt Ion Battery at 6500mAh. All of my wiring seems to be correct, I am happy to post pictures. Please help I need to get this unit working. 3c: Motor makes noise but seems to be stuck, it steps but very quietly but does not move. I have tested the stepper motor with another driver box I made (not a Chronos, and it works just fine using Black | Green and Red | Blue cable config. It is almost a 3v 128oz 2a 6 wire stepper. White and Yellow cables not in use. I notice in the Chronos instructions a Black | Yellow and White | Red config? Seeing as the motors are almost indentical I have tried the Chronos wiring and I get the same stepper sound as my config? I hope someone has some thoughts on this? 1) 815 should be just fine. 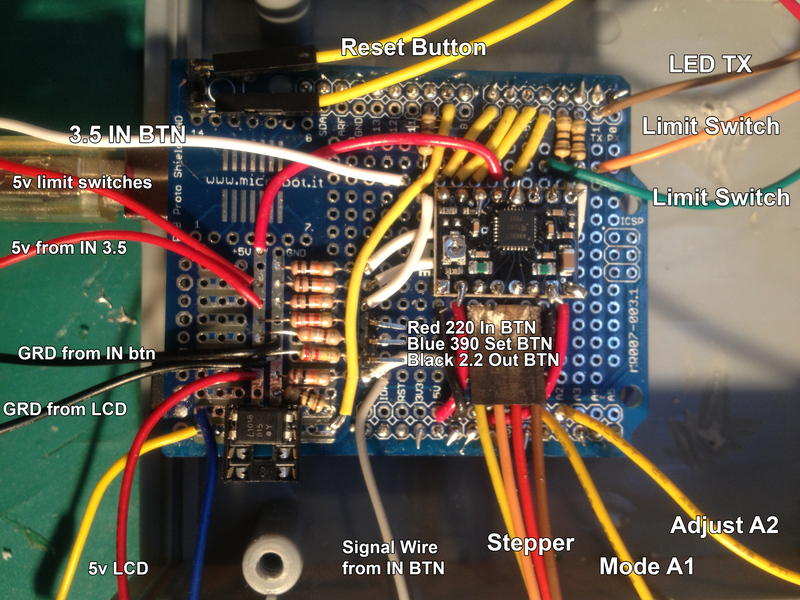 3a) Re-check what pin the display is connecting to on the arduino shield, it should be pin 1. There is an old set of instructions floating around that has it on pin 7 or 8 or which is no longer correct. The instructions on the website should be up to day, let me know if they are not. 3b) those balues should be ok, but i wouldnt bother updating the code untill you are getting a read on the IN button. What value is presented? 0? 1023? What value do you see when nothing is pressed? it should be 0. if it is not 0 then something is shorted out. For the dials, what value is displayed? 0? 1023? something in between? For the motor, lets get the display and controller working first so we know what it is supposed to be doing. Generally untill you use the Calibration mode and set everything to default the motor wont do much. There are 5-6 different motor speeds that have to be burned into the EEPROm, using the calibration mode (not the calibration tool) by putting MODE to POS, then press <- and SET you can enter this stuff, or have it perform a factory reset where it laods the defaults.. But you cant do that untill the display is working. Just gathering pics and data - stand by will reply in a few minutes here. Hi Chris thanks for the reply. Here are the answers to you. 2) Limit Switches I hooked them up temp anyway, they might be useful in the long run - but are easy to unhook to simplify things if need be. I am not using the DIP9 connector, they run seperately from my Stepper 4 pin connection. 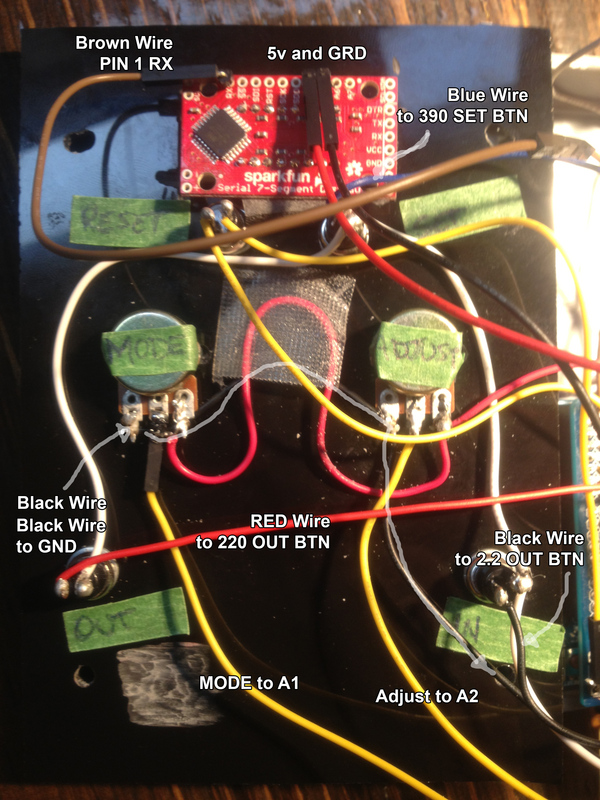 5v is Y split at protoshield (red wire). FYI zero display on LED when plugged in via USB from computer. if you used the correct resistor values then something is really off here. I think it would be best to try to tackle one thing at a time. And lets start with the display. I want to see that functioning properly first and foremost. 1) Check for continuity between the arduino shield PIN 1 (test on the top side of the protoshield on the top of the header pin that plugs into the arduino, and the RX on the display. Put the multimeter on the Ohms or Resistance setting, it should read 0 ohms. 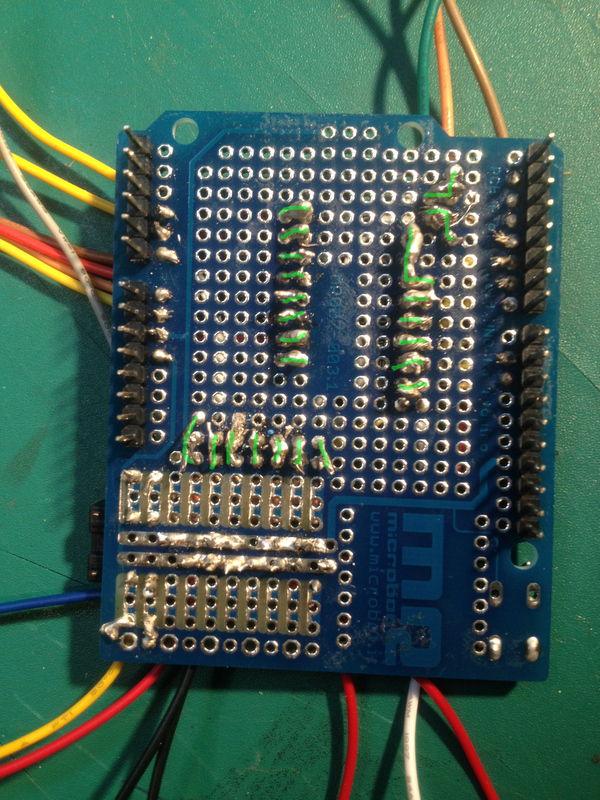 If it reads anything else, then re-heat the solder connections and re-test it. 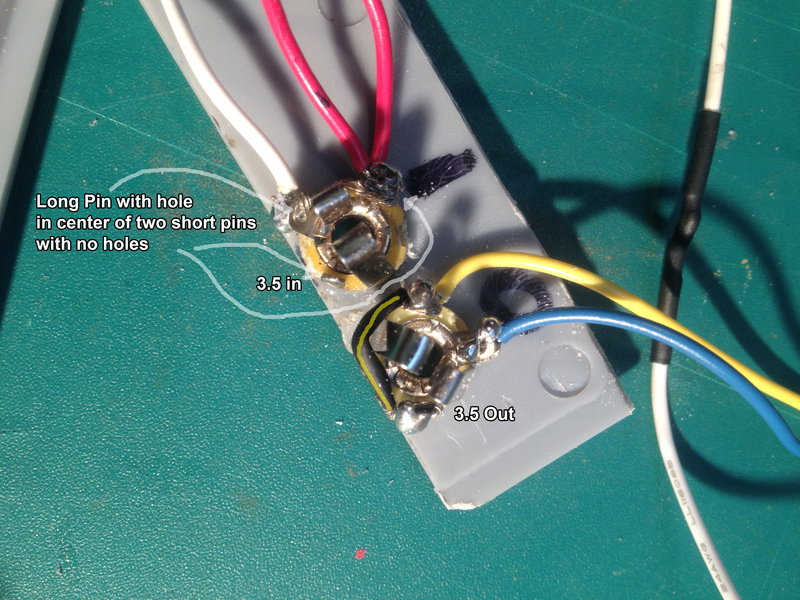 I am not clear on the path of the black wire from the potentiometers, is that the GND from IN? Can you send me the full resolution images to projectchronoshelp@gmail.com?